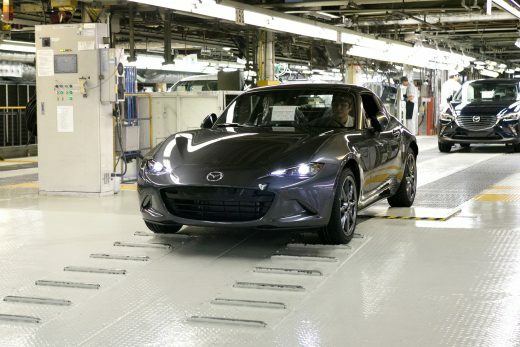 With production having started at Mazda’s Ujina Plant in Hiroshima Japan, the all-new Mazda MX-5 RF Retractable Fastback will go on sale on the UK on the 4th March 2017. 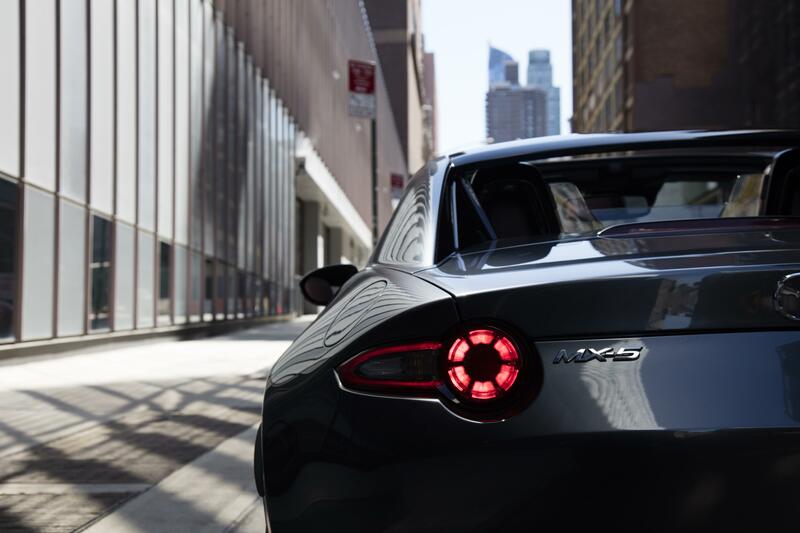 With the first cars produced heading to Europe and North America, UK drivers will be able to get behind the wheel of Mazda’s exciting new MX-5 Retractable Fastback early next year. With a limited run of just 500 cars, the six model range will be heralded by the flagship Launch Edition. Powered by a 160ps 2.0-litre SKYACTIV-G engine, the Launch Edition is marked out by its unique twin-tone roof, BBS wheels, black door mirrors and black rear spoiler. Available with a choice of free-of-charge Soul Red or Machine Grey metallic paint, it also comes with a Safety Pack as standard, while the exclusive feel continues inside with Alcantara trim and Recaro seats. As with the established Mazda MX-5 convertible, all models powered by the 2.0-litre 160ps engine feature a limited slip differential and 17-inch wheels; while Sport Nav models (and the Launch Edition) feature Bilstein dampers and strut brace to further enhance their dynamic set up. Plus, with the introduction of the £27,095 Sport Nav Auto, the current generation of MX-5 is offered with an automatic gearbox for the first time in the UK. Offered in both SE-L Nav and Sport Nav trim, RF’s powered by the 1.5-litre 131ps engine will arrive in dealerships in May. Developed to deliver enhanced cabin comfort and a refined ride, while at the same time maintaining the agility, performance and driver engagement of the MX-5 convertible, the suspension and electric power steering parameters of the all-new Mazda MX-5 RF have been specifically tuned for the Retractable Fastback. In addition, a sound-absorbing headliner used in the front and middle roof panels combines with sound insulation around the rear wheel housings to deliver a significantly quieter cabin when the roof is closed. “With the all-new Mazda MX-5 RF we freed ourselves from traditional ways of thinking and took on fresh challenges in order to create something new. Our aim was a convertible sports car with gorgeous fastback lines when the roof is closed and an exhilarating open-air feeling when open”, commented Nobuhiro Yamamoto, Mazda MX-5 Programme Manager. 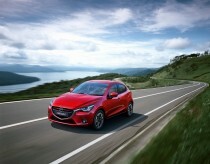 On the Launch Edition the front and middle roof sections feature a piano black finish that contrasts with the Soul Red or Machine Grey metallic paint, which both use Mazda’s unique “TAKUMINURI” paint process to deliver glossy depth and nuanced shading that intensifies the contrasts between light and shadow with its high-density finish, giving the impression that the body was sculpted from a solid block of steel. Building on the all-new Mazda MX-5’s award-winning design, the RF’s roof up style will set it apart when it arrives on UK roads early next year. A 5mm increase in roof height aside, the RF retains the same overall length, width and wheelbase as the MX-5 convertible, but thanks to gently downward slopping buttresses that tuck in at the sides to create a teardrop shape, the RF’s elegant fastback silhouette accentuates the MX-5’s dynamic and contemporary sports car proportions in a completely unique way. “If we consider the convertible model to represent the purist of lightweight sports car appeal, the new Retractable Fastback epitomises a new type of MX-5 that aims to be a compact sports car with a natural charm that everyone will find beautiful”, commented Masashi Nakayama, Mazda MX-5 Chief Designer. With pre-order now open, the all-new Mazda MX-5 RF will arrive in dealerships on the 4th March 2017 and promises to add another chapter in the MX-5 success story. Jeremy Thomson, Managing Director of Mazda Motors UK said, “we’re very excited about the arrival of the all-new Mazda MX-5 RF. It will add a unique and stylish model to our range, one that stands distinct from the MX-5 Convertible, yet retains all the award-winning driver appeal our sports car is famed for.